At your first visit we will give you an overall treatment plan for your main complaint. Feel free to check in about your treatment plan with one of the acupuncturists- or ‘punks as we like to call ourselves- anytime. A course of acupuncture treatment in China can be as frequent as 1x per day for 10 days in a row. Some complaints, including pain of all kinds, can require 3 courses or 30 treatments , with 3 day breaks between courses. We realize that most people can’t come every day for a month. We don’t want you to have to do that either; our sliding-scale and hours (we’re open 7-days a week!) are set-up to help people come as frequently as needed to get better and stay better. We will work with you to figure out what the best course of treatment is for your specific condition or health goals, but ultimately you will be the best one to assess how well acupuncture is working for you. We may suggest a different treatment plan if our initial recommendation does not produce the results you want. For the majority of complaints we see, we suggest acupuncture treatment 2x week for 3 weeks. For some people 6 treatments begins to resolve their issues. For others, it’s just the beginning. How long you’ve had something, your age, general condition and the nature and chronicity of the complaint are all factors in how much treatment it will take to see results. The longer the history of a complaint, generally, the longer it takes to treat. Most people get some benefit from a short series of acupuncture treatments. If you see some benefit after 6 treatments it is likely that more treatments will continue to improve or at least, maintain the progress you’ve made. Rarely we see people get better after 1 or 2 treatments. And unfortunately there are just some contains that do not respond well to acupuncture. When that is the case, people still find that acupuncture can benefit them in other unexpected ways; for example they may still have better sleep or less tension in their body. Because of the positive, general effects acupuncture has for most people, people sometimes continue to get acupuncture for other things even when it does not address the reason that initially brought them in. We ask that you give it at least 6 treatments, close to or at the frequency we’ve recommended, before deciding if it is working at all. If you are seeing some small changes at that point we will suggest that you continue to come at about this same frequency for a bit longer. If you are seeing big changes after 6 visits we will recommend that you come a few more times, most likely with more time between treatments, to test how well your progress holds. After that we can recommend if and how often to come in for maintenance treatments. For some people that’s once a month, for others, once per week. We don’t usually give up on acupuncture helping someone if there are not significant changes in 6 treatments, but it is always up to you to decide if it is worth your time, and money to continue if there are few obvious changes initially. We would love it if acupuncture helped everyone a lot, and right away, and sometimes it does. But unfortunately, sometimes it doesn’t. First Visit: Do I like getting acupuncture? The first time you get acupuncture is partly seeing if acupuncture a good fit for you. If your experience the first time is a good one, and you enjoyed getting treated with us, then we’re more likely to be able to help you with acupuncture than if you hate needles or don’t like the community setting. Minor changes often occur with a single treatment, but most things require a short series of treatments to see lasting and progressive results. Initial Stage: Will acupuncture work for me? With your 2nd through 6th treatments we continue to focus on addressing your main complaint and moving towards your health goals. We hope you see some shift in your conditions/symptoms within the first 6 treatments and work together to assess if and what kind of changes are happening. Changes often include decrease in pain or symptoms, but can also include being able to do more, recovery more quickly, or needing less of your medication. Please note that changing your medication is something you need to do with your doctor or medical practitioner. We never change peoples’ medications or dosages. For some people a sense greater sense of ease in general, or in managing their condition, is one of the first things they notice. We can usually work on your main complaint as well as a secondary one during your visits. For acute to severe conditions, we recommend 6 treatments in 1 to 2 weeks, treatments can as frequent as daily or every other day. For moderate to mild conditions, we recommend 6 treatments in 2 to 3 weeks. For chronic conditions, we recommend the same initial 6 treatments in 4 to 6 weeks. 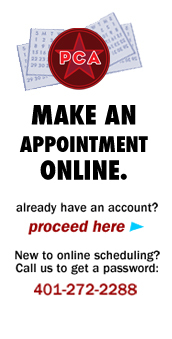 PCA will give you a written treatment plan at your first visit with our recommendations on it. How many acupuncture treatments will it take to reach your goals? Honestly, we can only guess based on our experience with similar conditions. Chronic conditions takes roughly a month of treatment for each year the condition as existed. Lasting changes take place over time: take the number of treatments it took to reach your goal and double that. For example: if it took 4 treatments to make your elbow pain get down to a 2/10 and you’re happy with that, then we would recommend another 4 treatments, which could be spaced further apart than the first four. We regularly re-evaluate patients to make sure we are still on track and if treatment continues to make sense. Do what works best for you; you’re the best judge if treatments are helping or not. Some people just like getting acupuncture regularly. That’s okay with us too! Sometimes people come in with little or no real complaints and just want treatments as a preventative, to maintain satisfactory health levels, or because it’s very relaxing. Frequency of treatments at this stage can be from once a week, to once a month, or seasonal. Do what works for you. What week of pregnancy can you start induction points?? There is no standard week for beginning to using induction points. It really varies from pregnancy to pregnancy. For example someone with twins might begin having induction points at week 36, and some people don’t begin having induction points until after week 40. We think it’s important that you discuss options with your midwife, and/or obstetrician. And we’re happy to treat people throughout their pregnancies for everything from morning sickness, to low back pain, fatigue, and to help move things along at term. If you have more questions specific questions, hopefully we could answer those for you. Great! Thank you so much! My mom received a mini session at Pride and is hooked! My son also received a mini session and i was less than pleased to find a needle still in his neck! Glad your mom liked the treatment and hopefully you noticed the needle in your son’s neck before you walked away… it’s always a good idea to check behind the ears, in the hair line etc. Sometimes those spots are hard to see a needle in especially if a different “punk” is taking the needles out than the one that put them in. how long does each treatment take in the office? Once the needles are placed, we let you stay as long or as short as you like. On average people stay 45minutes to an hour, but some people stay longer and some are done after 30 minutes. You can always let us know if you have to leave at a specific time, and we are always circulating around the room and keeping track of who is resting/relaxing and who is ready to go. How much does it cost? And I want to treat social anxiety? Is that treatable and how often is it recommended?! Our sliding scale is $15- $35 per treatment you decide what to pay. There is a 1 time new patient fee of $10 for the first visit. We treat all kinds of anxiety with good results. The best way to find out if acupuncture will work for your particular situation is to try it. We like to do a basic intake with folks before giving them a specific treatment plan, but for many chronic things we find that 1-2 x per week is helpful. For more acute situations we sometimes recommend more frequency especially in the beginning.